For the partner Chamber of Commerce, Industry and Agriculture of the Arad County, please have a look at http://www.ccia-arad.ro/. For the partner Economic High School Arad , please have a look at http://www.leconomic.home.ro/. The training courses in Romania were organized at Economic Highschool Arad on January 12, 14, 20, 26 and 28, 2010. 18 Teachers and 5 members of staff participated at the courses. Here we provide you with the documents from the training. 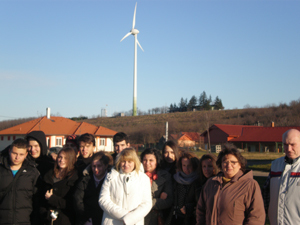 On December, 10th 2010, we (Economic High school Arad, CEA) organized a visit to a Wind Park in Kulcs, Hungary. This park is situated 59 km south from Budapest, close to Kulcs on the bank of the Danube, on the top of a hill .The first grid connected 600 k-W nominal capacity wind mill started its operation in the summer of 2001. 56 students and 2 teachers from Economic High school Arad performed the visit. Before leaving, the students were informed about how electricity is produced using wind power. Kinetic energy of a propeller blade collects the wind that turns into electricity through a generator. A wind farm is a group of wind turbines in the same location used for production of electric power. Individual turbines are interconnected with a medium voltage (usually 34.5 kV) power collection system and communication network. At a substation, this medium-voltage electrical current is increased in voltage with a transformer for connection to the high voltage transmission system. A large wind farm may consist of several hundred individual wind turbines, and cover an extended area of hundreds of square miles, but the land between the turbines may be used for agricultural or other purposes. Students have admired these turbines and have been impressed by their size. This output has reached its goal, students have seen that electricity can be directly produced without emitting pollutants and greenhouse gases, because it does not burn fuel, producing no waste and energy costs per unit produced are reduced. After this visit, the students have performed essays on the topic "Alternative Energy Sources». Technical Description: The generator is 600- kW made by ENERCON. Foundation with 12 m diameter and 1.5 m deep. The diameter of the 3 blades is 44 meter. The tower is 65 m high with a diameter of 2,4 m (down)- 1.2 m (top) weighing 94 tones. The sickness of the wall is in average of 20 mIt starts to work at the wind speed of 2,5 m/s and stops when the wind speEd is more than 25 m/s. „Vasile Goldiş” Western University of Arad was founded in 1990, and became accredited 2002 by law no. 240. Its spiritual patron is the brilliant historical personality of Vasile Goldiş, ideologist of the Great Union taking place on 1 December 1918.